Deputy President William Ruto has insisted that no Kenyan has starved to death because of the drought in parts of the country. Speaking on Wednesday during the Inter-professionals Summit in Mombasa, Dr Ruto dismissed media reports that 11 people have died. "There is a lot of fake news about what is happening. We have been told that 11 people have died but that is not true. No one has died as a result of the drought and we are working round the clock to ensure that no one dies of hunger," said Mr Ruto. The DP said chiefs who reported the deaths were taken for questioning "as they are playing around with a serious matter". The Deputy President further said the country is not facing a food crisis but a challenge in food distribution. "We are working with other government departments and counties to ensure we accelerate distribution of food across the country," he said, citing collaboration with parties including the World Food Programme (WFP). 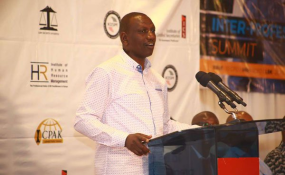 Dr Ruto further said the government identified both short and long term interventions that will ensure "we get out of a situation which is not an emergency because it is expected". On short term interventions, he said rains are expected to fall next Friday according to the Meteorological Department.